Rohit and Sugandhika’s tasteful wedding held at Crowne Plaza, Delhi is filled with stunning outfits, décor details and a love story that inspires. A friendship that began in engineering college where Sugandhika found Rohit to be not just her super senior, but her soul-mate too, continued long distance and lasted almost a decade – 9 years to be precise! The wait, distance and time were all merely measurements where this super couple was concerned. Nine years in a long distance relationship - some serious #RelationshipGoals right here. Finally, when the wait ended this beautiful couple decided to tie the knot at Crowne Plaza, Delhi – and what a way they did it! Meaningful ceremonies, traditional rituals, lehenga twirling and a whole lot of love! Rohit and Sugandhika’s tasteful wedding held at Crowne Plaza, Delhi was all kinds of inspiring. 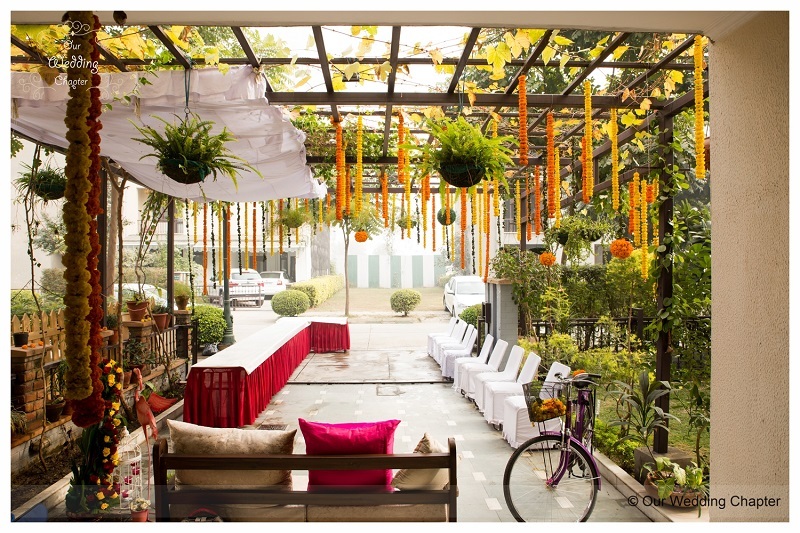 An intimate mehdni ceremony decorated with fresh marigold strings and topiaries brought in the perfect homely feel to Sugandhika's mehndi ceremony - cause after all, what is a Mehndi ceremony without marigolds? A few close friends, family and this gorgeous bridal mehdni was all that was needed to make this pre-wedding ceremony a memorable affair. Shimmer gold tassle backdrop, first dances and a larger-than-life heart - this is what Rohit and Sugandhika's Sangeet + Engagement was made of! She donned a stunning anarkali lehenga from Om Prakash Jawahar Lal, in a hue of reddish-pink adorned with delicate little floral buttis. Her kundan choker especially made from her family jewellery was the perfect accessory to go along with her elegant engagement attire. The raw-silk lehenag coupled with the sheer anarkali was an indian bridal attire shown in all it's glory. Rohit too looked dapper in his sharp grey suit from Raymonds. Rohit made an enterance the classic way on his ghodi with a loud naach-gaana filled baarat and loads of pretty lights. The wedding saw this handsome groom dressed in a dapper sherwani from Diwan Sahib - the weaved texture on the black base made his wedding sherwani both contemporary and classy all at once. And Sugandhika, our gorgeous bride took the bridal lehenga game up by multiple levels in her bubblegum pink DIY lehenga. She picked up her lehenga from a bridal store in Delhi and made her own sheer, scalloped edged dupatta to match - beauty and brains right here! 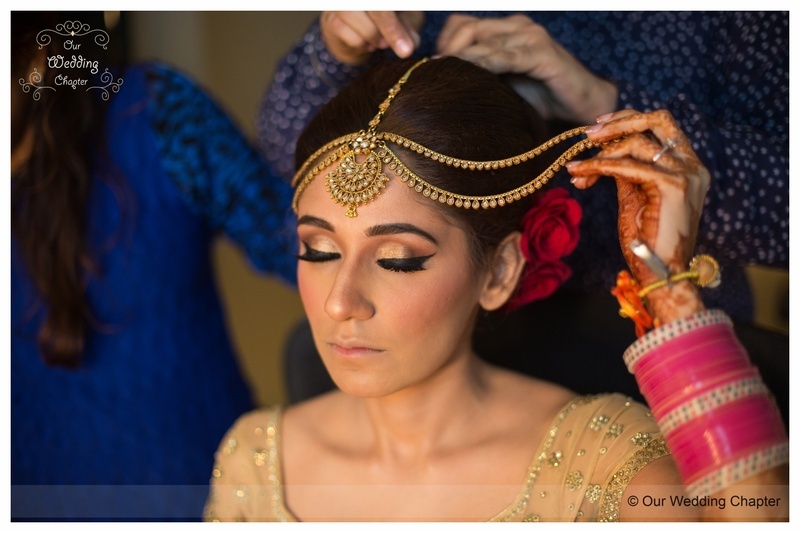 Her bold bridal makeup by Guru had the perfect tones of gold and beautifully winged eyes. An ideal look for Rohit and Sugandhika's tasteful Delhi wedding ceremony. Read more Real Wedding Stories here!